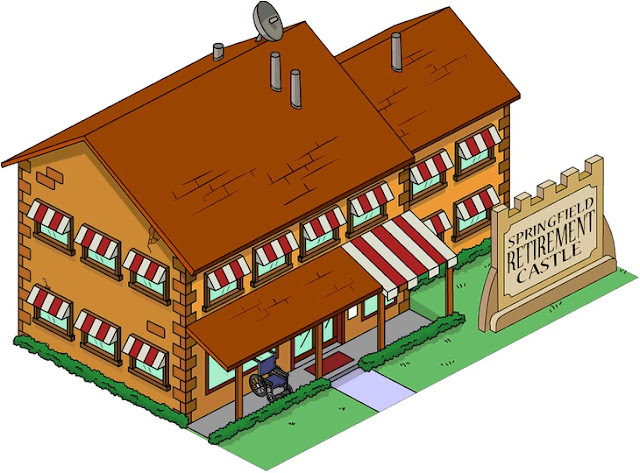 Editor's Note: This post belongs to a series on retirement planning. If you haven't seen it, check out the first post in the series and start at the beginning. This step may not be particularly important for most people who want to retire early, but it will be informative. For some it may even be the final step, if they realize they could retire immediately with their current spending and savings. 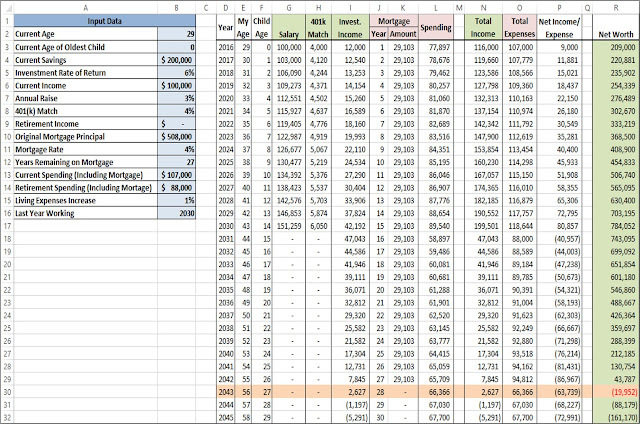 In order to complete this step I created a very useful little spreadsheet (available for download here) that takes most of the effort out of the calculation. All you have to do is input a few pieces of information about yourself. You should know most of this information, or at least be able to find it pretty easily. 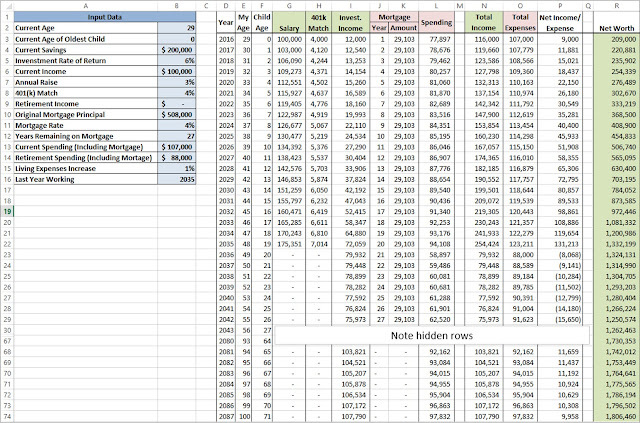 A couple fields will be assumptions, like the rate of return on your savings, but we can use historical averages. The main unknown will be the year of retirement. To start, you can use any year in the future, but we will play with it to see what the earliest possible retirement date is on our current budget. This spreadsheet works by calculating your net worth over time. You can track up to any age you like, but I’ve been looking at data up to when I will be 100 (the year 2087), which might be a bit extreme, but it's better to be safe than sorry. If net worth goes negative before that, it means I ran out of money. If it stays positive, I should be ready for retirement. Note: I realize the spreadsheet used in this post is highly simplified and makes many assumptions, but I think it is accurate enough for our purposes. 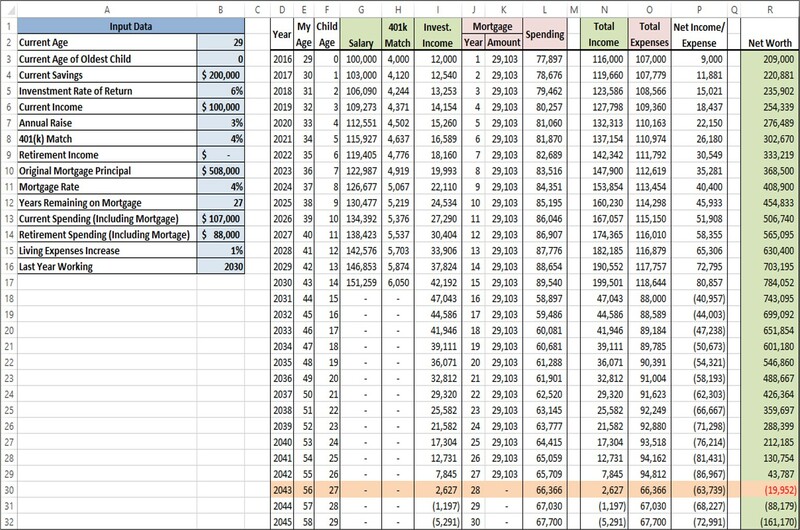 If you have suggestions that would improve the accuracy of the spreadsheet but maintain its simplicity, please let me know in the comments. For this demonstration I will be looking at my family’s finances again, but some of the numbers are approximations for simplicity and privacy. I started by entering all my information and arbitrarily setting the retirement year as 2030. Unfortunately, that results in us running out of money at age 56. Not good. Now I will increase the retirement year until the net worth stays positive until I am 100. That ended up being 2035. So now that I know I will have to work through 2035 (age 48) if I want to maintain our current spending, I have a big decision to make. Do I like our current lifestyle and am I willing to work that long, or do I want to reduce our spending and retire sooner. If I was willing to work until 2035, I would be done with my retirement planning for now, but I have no interest in working for another 19 years, so I’m going to continue on to Step Three, which is planning how to reduce our spending. I will cover that in my next post. How many more years do you have to work if you maintain your current spending? Let me know in the comments.